Five bedroom homes represent the perfect place to start a new life as a family. With space for parents to get away, the children to play and more than enough room to relax and entertain, our four bedroom homes for sale across Yorkshire and the Midlands offer first and second-time buyers the opportunity to live the life they’ve always dreamed of. 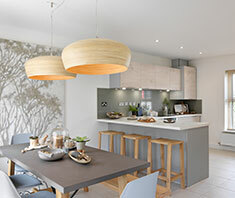 The ideal properties in the ideal locations, our five bedroom houses for sale include detached and semi-detached properties with spacious living areas, open-plan dining and large gardens making them the perfect new homes for you to raise a growing family. A beautiful market town filled with character and history, Chesterfield has plenty to offer growing families thanks to its excellent location, good schools and countless things to see and do. Located to the east of the Peak District, Chesterfield is just a short drive from Sheffield making it a prime town for commuters and families with our 360 development offering a number of beautiful five bedroom houses to buy and call your home. The popular style of Naples homes are already available to buy and proving a popular option with integral garage, winding staircase, first floor lounge and a second floor master bedroom complete with spacious dressing area and an en suite. As the 360 development continues to take shape we’ll be opening up more new five bedroom homes including Bordeaux, Lausanne and our Valencia properties, a collection of five bedroom detached homes offering residents an integral garage, large bedrooms, open-plan living and a garden. Where in Chesterfield is the new 360 development? Just two miles from the centre of Castleford is our Attitude development, a collection of four and five bedroom homes in the Whitwood area of town. The perfect location for commuters thanks to its proximity to the M62 motorway and Castleford railway station, this new development is ideal for professionals and growing families alike with good schools, amenities and activities nearby. The five bedroom detached homes available at Attitude come in the form of our Palermo properties, a group of new build homes with open plan kitchen-dining room, impressive first floor lounge and a beautiful master bedroom complete with dressing area and en suite. Also included with the Palermo is an integral garage, tarmac drive, rear-facing garden, utility room and a winding staircase. Where in Castleford is the new Attitude development? If you’re a fan of living in Yorkshire and are looking for somewhere close to towns like Halifax, Huddersfield and Dewsbury – and within a short distance of the motorway – then Cleckheaton should definitely be on your shortlist when choosing where to live. Our new development in Cleckheaton, Aura, consists of three, four and five bedroom homes in the south-west of the town in an area called Hartshead Moorside. At our Aura development you’ll find our Palermo and Valencia styles of five bedroom detached homes. 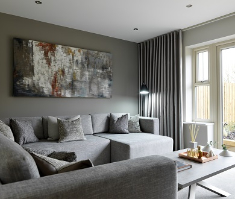 Each of these beautiful new five bedroom homes offers residents an integral garage, rear-facing dining room opening out onto the garden, en-suite master bedrooms and large spacious bedrooms for a growing family. Where is Cleckheaton, and Strata’s Aura development? Villages in Yorkshire are always beautiful and packed full of character. Eckington is another of these picturesque, quaint British villages situated between Sheffield and Chesterfield; and this is where you’ll find our Belong development. A collection of four and five bedroom homes with a number of semi-detached and detached properties being released soon, Belong represents the ideal location for a growing family to put down some roots in the heart of rural Yorkshire. Belong has already generated a lot of interest with many of our four and five bedroom homes having already sold out but don’t worry, there are still plenty of new build homes available. Shortly to be released, our Naples style of five bedroom homes feature an integral garage with the property itself spread over three floors. This five bedroom detached home has a dining room to the rear that faces out over the garden while a winding staircase leads to the first floor lounge, two bedrooms and a family bathroom. On the second floor is the master bedroom with en-suite and spacious dressing area, along with two further bedrooms. Where is Eckington and the Belong development? Living in the Midlands means you’re never too far away from towns, transport links and beautiful countryside. Brizlincote, a residential area to the south of Burton-on-Trent, has rolling countryside all around but local towns within a short journey offering the best of both worlds. Encore, our latest development in Brizlincote just 15 miles from Burton, offers a collection of four and five bedroom new build homes perfect for growing families. 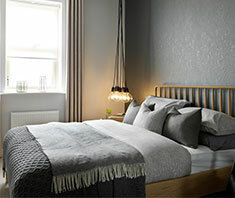 Available to buy right now are our Palermo style properties, a collection of five bedroom detached homes spanning three floors with master bedroom including its own en-suite and a dressing room, and four more generous-sized bedroomsr, plus an open-plan kitchen-dining room that looks over the garden, a private driveway and an integra garage. Our Valencia homes are awaiting release and represent a different style of five bedroom detached homes at Encore. A spacious lounge with large bay window is situated at the front of the home, while thethe enviable kitchen, dining and living space span the rear of the home.Anintegral double garage and five bedrooms complete this family home. The master bedroom benefits from en-suite and private balcony overlooking the front of the home, letting in natural light and opening up the space. Where is Brizlincote and the new Encore development? A brand new development of two to five bedroom homes in Dishforth near Harrogate, Esteem is one of the newest Strata housing developments. A picturesque village in North Yorkshire, Dishforth offers residents a peaceful village life with two of the most popular cities in the area – Harrogate and York – both just a short drive away on the nearby A1 (M). At Esteem you’ll find a number of options when it comes to five bedroom homes including our Siena, Capri, Valencia and Bordeaux properties. All four styles are detached homes and offer generous-sized bedrooms, master bedrooms with en-suitesand family bathrooms, spacious dining areas, large windows, gardens, private driveways and – with the exception of the Siena – integral garages (the Siena has a separate garage). Where is Dishforth and the new Esteem development?